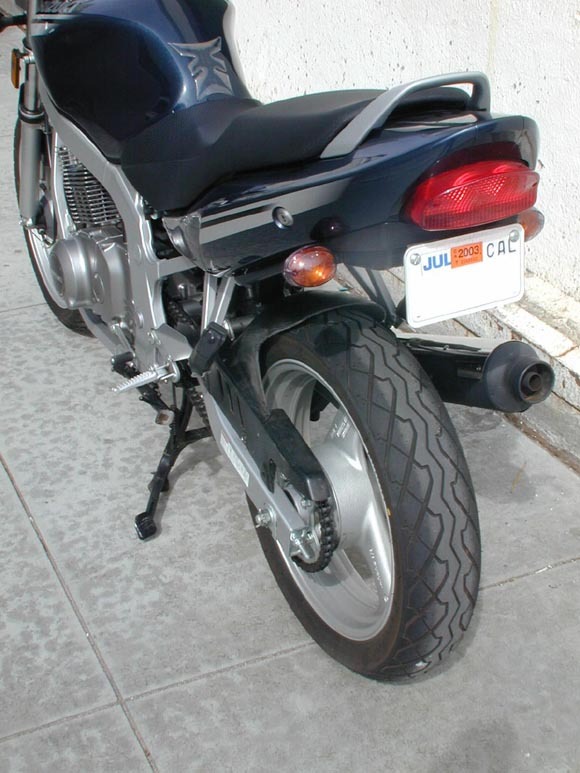 Suzuki GSF400's (bandit 400) came stock with a rear hugger fender. Bandit 400's were imported into the US only in '91-'93. The US and UK models came stock with a rear hugger fender. These are available for $112 at Bikebandit.com (previously thought they were $54-sorry). Also available from powerbronze.co.uk as aftermarket for $75 and from Parts Depot in the US for $86 (1 800 245 3101 ask for Robert). I got mine from a Bandit 400 forum used for less, but it took time. Bandit 400 forum can be found in the links page. This may be the only option for a hugger since an aftermarket one isn't available. Bandit 600 aftermarket hugger is also an option but is a completely different looking hugger. See Joris' install description at bottom for a Bandit 600 hugger install. 1) Remove left side heel guard (or peg bracket assembly) to access the front chainguard attachment screw. 2) Remove chainguard by removing two screws. 3) Slide hugger in place to get an idea of what has to be trimmed. First you'll notice you have to trim the front right section to clear the brake stay arm attachment point. You'll also have to trim the rear right section to clear the brake caliper and hoses. I used a dremel tool on slow setting then sanded the cut edges. Mark location of chainguard holes since hugger original hole locations do not line up. 4) Redrilled the chainguard holes-rear one installs on same side as original chain guard (with mounting bracket on inside), fit is best with front part of hugger on back side of front install tab. I don't have a screw holding it on there yet. Will zip tie for now. 5) Right side on with zip tie temporarily, strung through one of the existing slots in hugger. make sure edge of hugger is inside brake line and resting on swingarm. This is necessary for proper alignment. You will likely have to play with it a bit to get alignment over wheel just right. I will JB-Weld a tab to screw attach hugger to swingarm in the future to eliminate the visible zip-tie. 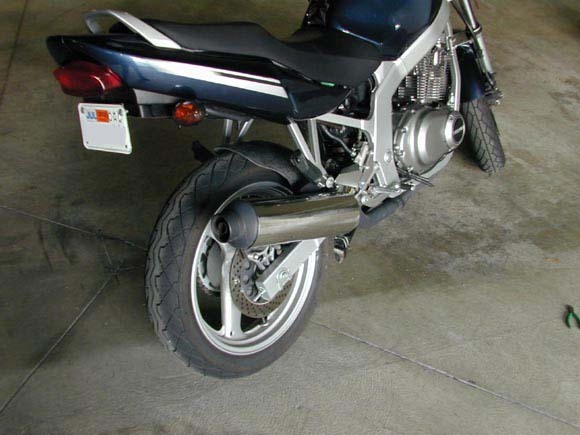 Make sure final mounting hole location you choose allows you enough room to get a screwdriver or ratchet on underneath the exhaust canister. The stock hugger is very large-meaning that it covers the wheel farther than top center rearward and the tail end past top center becomes flat. This seems to overwhelm the stock wheel. I cut the rear top edge about 6" back and cut/rounded the side edges of the hugger about 3" to finish out the look. The portion I cut off extended a little past end of chainguard! 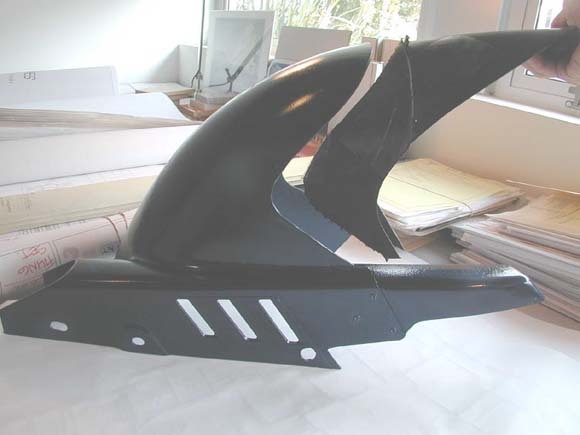 For final install I cut back a bit the chainguard rear end and did some final sanding and painting to match body color. The actual install was done using the rear chainguard screw, a zip tie on front chainguard mounting hole (since I had to mount chainguard on inside of tab for alignment on tire) and zip tie on right side to brake line where swingarm clamp holds it down, with bottom edge of hugger fender resting on swingarm on both sides. Note that this is installed on stock 130 section tire leaving about 12-15mm clearance on each side. 140 section tires will likely fit as possibly 150 section tire but these will make final fit more labor to get the alignment of the hugger over the tire correct. The 150 section tire is less than 150 true cross section when mounted on narrow stock GS rim. 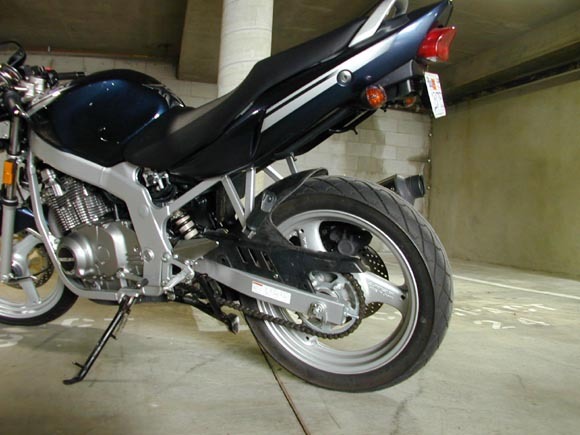 If you are running a wider rear wheel you should consider the Bandit 600 rear hugger instead.